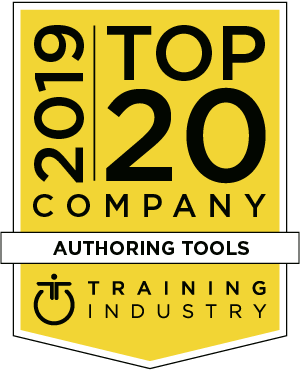 "Trivantis stands out among other companies in this sector and warrants a place on the Training Industry Top 20 Authoring Tools List due to its assessment and reporting capabilities and history of industry recognitions and awards," said Ken Taylor, President of Training Industry, Inc. "The organizations on the Top 20 List are leaders that are developing innovative and engaging authoring tools in the learning technologies market." While Lectora has grown and evolved with the eLearning industry over twenty years, its younger sister product, CenarioVR for VR authoring, also contributed to Trivantis' inclusion within Training Industry's 2019 Top 20 Company Authoring Tools List. "The Training Industry Top 20 Authoring Tools List is comprised of companies that provide leading features and capabilities to the corporate learning professional," said Danielle Draewell, Research Analyst at Training Industry, Inc. "Trivantis provides tools for eLearning authoring, immersive learning and learning management. Its immersive authoring solution, CenarioVR, now includes support for Oculus Go, Samsung Gear VR, and other headsets…"
"We are thrilled to be recognized for the value Trivantis brings to eLearning," said Laura Silver, Chief Operating Officer of Trivantis. "20 years ago, Trivantis changed the industry by creating Lectora, the first and yet still the most powerful authoring tool. Now Trivantis is changing eLearning once again with CenarioVR, which makes immersive learning easy, affordable, and within reach for every learning professional." For more information on Trivantis' eLearning products, please visit www.trivantis.com or contact sales@trivantis.com for product demos. To schedule an interview with the executive team, please contact Christie Calahan, Director of Marketing, at christie.calahan@trivantis.com. Training Industry (http://www.trainingindustry.com) presents news, articles, webinars, and research reports focused on supporting the corporate training leader and offers complementary referrals to training professionals seeking to source products or services at https://trainingindustry.com/rfp.